Straightening your teeth is an exciting thing to start doing, but it can be daunting if you’re not fully informed on the logistics of everything. Invisalign is a spectacular option for straightening your teeth, but there are a few things you should be aware of before you start. One of the main benefits of Invisalign is the discretion it offers its users because they don’t have to have a mouthful of braces. Additionally, you are able to eat and drink anything you want to while going through treatment since you remove your retainers to eat and drink anyways. Invisalign is obviously also very adept at aligning your teeth in a safe and healthy way. There is not just one kind of Invisalign – there’s Invisalign Lite, Express, Full, and Teen. Each treatment offers a variety of benefits and is designed to accomplish different goals. Invisalign Lite is great for fixing intermediate orthodontic issues and can move all of your teeth, including molars. Invisalign Express is ideal for fixing small problems very quickly; it’s great for those who need some fine-tuning to reach their perfect smile. 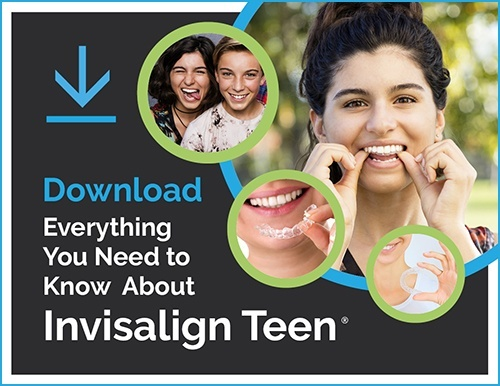 Invisalign Full is able to handle some of the toughest orthodontic cases, and Invisalign Teen is very similar. The main difference is that the teen option has replacement trays, color indicators, and room to grow, making it best suited for teens. Taking care of your aligners is not that difficult of a task to include in your daily routine. As long as you make sure to keep them safe and clean, you’ll be fine. You should be sure to brush them in the morning and at night with a little Dawn dish soap and a toothbrush. You can use toothpaste if you need to, but be careful since this can cause discoloration in the aligners. When not in use, aligners should always be stored in the case that came with them – you wouldn’t want them getting lost or accidentally thrown away! Under no circumstances should you ever eat food while you have your retainers in, and you shouldn’t drink anything other than water with them in either. Colored liquids can cause discoloration, and the residue from them will get trapped between your retainers and teeth and could cause cavities. Food would obviously result in a similar problem. When you’re done eating or drinking, you should brush your teeth before putting the aligners back in. If you can’t do that, at least rinse them thoroughly until you can brush. This will keep your teeth clean and healthy during your treatment. Depending on the severity of your misalignments, your treatment time is going to vary. The type of Invisalign treatment is also going to vary based on the same thing. It can range anywhere from 3 to 20 months, but if your treatment goes longer, don’t fret. Your orthodontist is just doing their best to get you the smile you deserve. Invisalign is a fantastic technology that has revolutionized the way teeth are straightened. It’s discreet, easy, and very versatile, and almost anyone can do it. For more information about Invisalign, or to see if it is right for your smile, schedule a free consultation by calling (970) 230-3667.